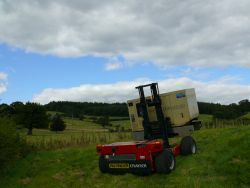 Radio controlled - The �operator can �drive the BM from the optimum position whether very close for perfect visibility or 300m �away for perfect safety. � The BM can be fitted with cameras for �accurate operation at long distances or when out �of the line of sight. 4WD - The powerful diesel engine and 4WD allows the BM to operate in offroad conditions. 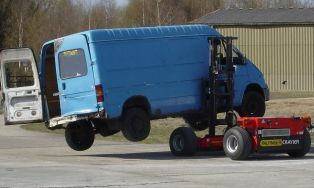 � This allows �easy transport of �heavy equipment �to exactly where needed. 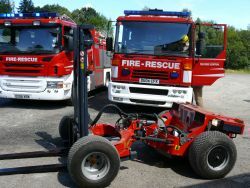 Lightweight - The low deadweight of the BM �allows the BM to transverse soft ground and permits easy transport �in �many �ways including on a car type trailer. 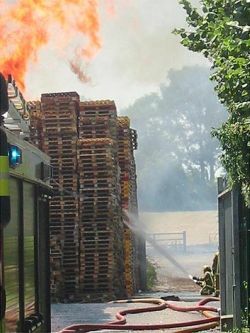 An example of where the Palfinger BM can help in an emergency situation could be a �pallet fire. 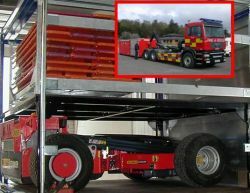 � In this instance the �Palfinger BM can be used to �move pallets / material �away from the fire.